Liftoff took place at 8:50 p.m. EDT March 21 (01:50 GMT March 22), 2019, from the Guiana Space Centre on the northern coast of South America. At the top of the four-stage rocket, encapsulated by a protective payload fairing, was PRISMA, a 1,937-pound (879-kilogram) Italian Earth-observation satellite. According to Arianespace, PRISMA, which stands for “PRecursore IperSpettrale della Missione Applicativa” (in English, Hyperspectral Precursor of the Application Mission), is a “state-of-the-art electro-optical instrument” that combines a hyperspectral sensor with a panchromatic camera. Over its five-year mission, it is designed to take medium-resolution photos to facilitate resource management, crop identification and classification, and to fight against pollution. To send the spacecraft into orbit, the 98-foot (30-meter) tall Vega rocket ignited its first of four stages. The P80 first stage was solid-fueled and burned for about 110 seconds. Just after the stage burned out and separated, the Zefiro 23 second stage ignited and burned for about 77 seconds before also separating. At the conclusion of that burn, the third stage, called Zefiro 9, also ignited and continued to burn for another 120 seconds. In the meantime, shortly after the ignition of the third stage, the payload fairing separated, exposing the PRISMA satellite to the vacuum of space. At around 6.5 minutes, the third stage finished burning and separated from the AVUM fourth stage. But before it ignited, a brief coast period took place to wait for the right moment to ignite its hypergolic-fuel-consuming RD-843 engine. That time came about 8 minutes after leaving South America. Upon ignition, the stage burned for about 4.5 minutes to place the spacecraft in a transfer orbit before another 39-minute coast phase began. Finally, at a mission-elapsed-time of 52 minutes, the AVUM stage ignited its engine again for a roughly 72-second burn to place PRISMA in a 382-mile (615-kilometer) orbit, inclined about 97.88 degrees relative to the equator. Two minutes later, the PRISMA spacecraft separated to begin its five-year mission. 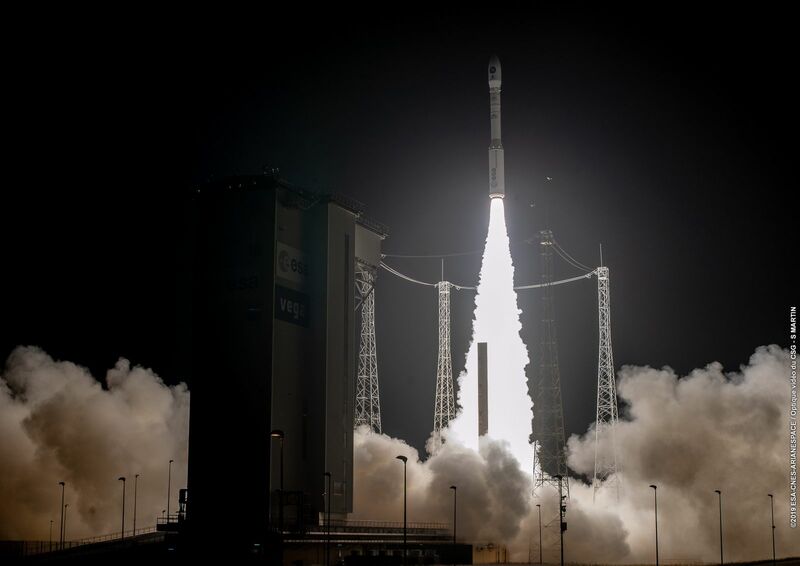 The flight was the third for Arianespace in 2019 and the first for the Vega rocket this year. PRISMA was also the 600th satellite orbited by the company. 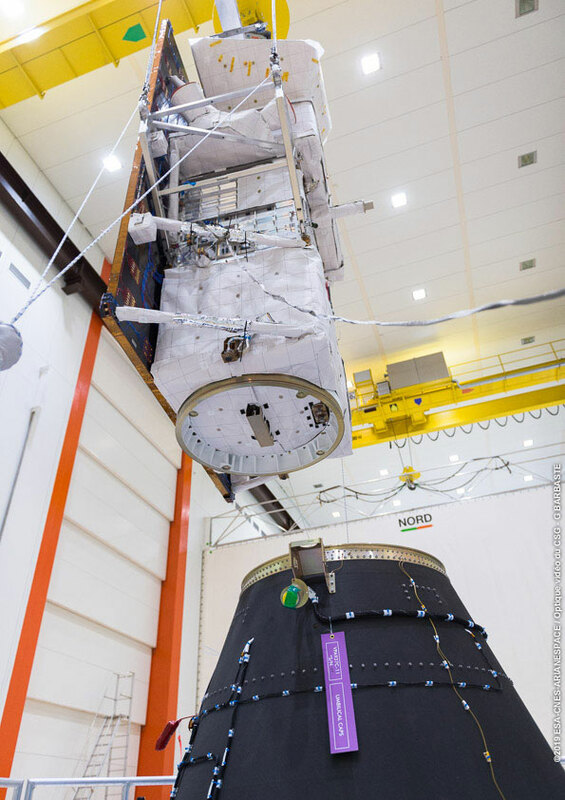 Arianespace’s next launch is expected to be on April 4, and will see a Soyuz 2.1b rocket send four satellites into space for O3b Networks.